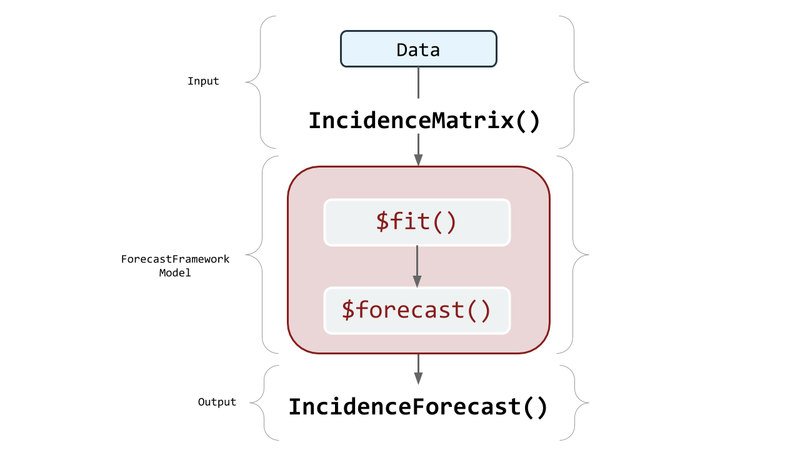 ForecastFramework is an object-oriented R package that standardizes forecasting models. The package uses the R6 class implementation to design an object-oriented framework for building forecasting models for spatial time-series data. The central goals of the ForecastFramework package are to enable rapid model development while standardizing and simplifying implementation and performance evaluation. ForecastFramework is one of the primary forecast modeling tools used at the Reich Lab at the University of Massachusetts Amherst. As one example, we use it under the hood in generating our real-time dengue forecasts for the Ministry of Public Health in Thailand. ForecastFramework was created by Joshua Kaminsky of the Infectious Disease Dynamics Group at Johns Hopkins University. This demo was created by Katie House. ForecastFramework is an open source R package hosted on CRAN and Github. Run these lines of code before performing the vignette. NOTE: you only need to run this once. This script installs all of the necessary R packages for the rest of the demo. 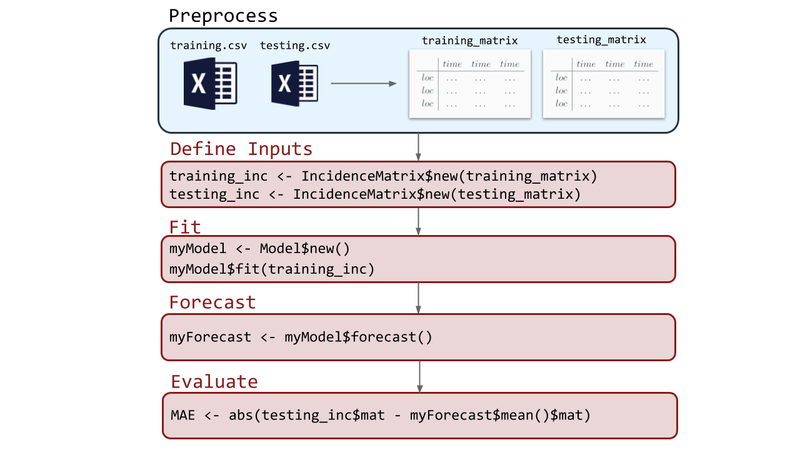 Before creating your own ForecastFramework models, let’s dive deeper into the forecasting process with ForecastFramework. Each of the subsequent vignettes looks into a part of this process. Note that the preprocesing stage will be included in the Defining Inputs Vignette. This section will examines the raw data used in the ForecastFramework models ahead. (Beginner Section) This section will define what an Incidence Matrix is, show how to format your data to be used as an Incidence Matrix, and exemplify functions of Incidence Matrices. (Beginner Section)This section will focus on fitting data to a SARIMA model with ForecastFramework. (Intermediate Section) This section will demonstrate evaluation metrics and techniques by comparing two complex models in ForecastFramework. (Advanced Section) This section will demonstrate how to create your own model with ForecastFramework. NOTE: This section requires object-oriented programming knowledge. This demonstration uses influenza surveillance data maintained by the U.S. Centers for Disease Control (CDC). Normally, the data include all 50 US states. For simplicity, this demo only models national data. These data are quickly retrieved with the cdcfluview R package. One of the measures reported by the CDC for quantifying respiratory illness burden in a population is weighted influenza-like illness (wILI). This is a metric defined as the estimated percentage of all out-patient doctors office visits due to patients who present with “influenza-like illness”, e.g. a fever, a cough and/or sore throat. This wILI percentage, at the national and regional levels, is calculated by taking weighted averages of state-level activty, with weights based on state population. These data include many attributes, but we will focus on: region,year,week,weighted_ili,week_start. Note that weighted_ili is the wILI measure reported for that specific year and week. 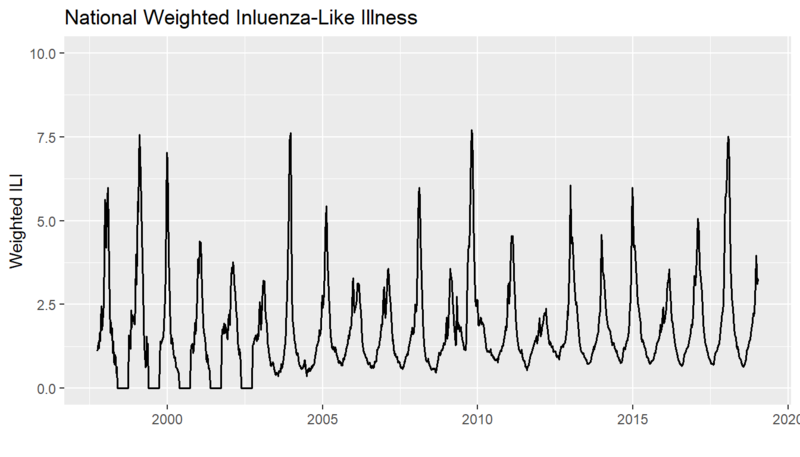 This demo will forecast an entire year’s worth of wILI incidence starting from the beginning of the flu season in 2016. ForecastFramework makes it easy to quickly manipulate forecasting data. To do this, create an object from a class called IncidenceMatrix. IncidenceMatrices are the stanard inputs for ForecastFramework models. This vignette describes how to create an IncidenceMatrix and some key fields and methods relating to their usage. The IncidenceMatrix class has several fields that can be helpful for data preprocessing. In object oriented programming, a ‘method’ is a function for a class. In this case, the following methods are functions that are applied to IncidenceMatrix. Let’s apply some of the example functions from above to our data_object. This demonstration focuses on the simplest building block of any large forecasting experiment or study: how to make a forecast from one model at one time point for a single location. ForecastFramework makes it easy to generalize this process to multiple models, multiple time points and multiple locations. However, for starters, we will focus on the anatomy of a single forecast from a single model. Specifically, we will use a variation on standard Seasonal Auto-Regressive Integrated Moving Average models. sarimaTD is an R package created by Evan Ray. sarimaTD stands for SARIMA with Transformations and Seasonal Differencing. sarimaTD is a model composed of a set of wrapper functions that simplify estimating and predicting traditional SARIMA models. These wrapper functions first transform the incidence data to approximate normality, then perform seasonal differencing (if specified), and input the new incidence data to the auto.arima function from the forecast package. These simple transformations have shown improved forecasting performance of SARIMA models for infectious disease incidence by increasing the numerical stability of the model. First you must import all the required libraries. Note that ForecastFramework doesn’t requre dplyr, ggplot2, cdcfluview or RCurl but they will be used for sourcing the models on Github, getting the flu data, and producing the data processing and visualization. Now it is time to fit your sarimaTD Model! ForecastFramework makes this easy. In this sarimaTD model, forecasts are created by simulating multiple time-series trajectories from models fit using the forecast::auto.arima() function. Therefore, we must define the number of simulations to generate, nsim. We also need to define the seasonal periodicity of our data, or the period parameter. For this forecast, we know the periodicity is 52, because the data is weekly. once we define these parameters, they can be passed into the sarimaTDModel() class generator to create a new sarimaTDmodel class. To import the fluview data, use the ilinet() command. The data is then filtered to remove unneeded weeks and years. Then, the data is stored as an IncidenceMatrix. An IncidenceMatrix represents spatial time-series data in a matrix with one row per location and one column per time. To do this, another series of transformations are made. IncidenceMatrix is the preferred input for ForecastFramework Models. Notice that the traditional dates have been transformed to fractions of a year. Typically, different regions would be fit separately and have different forecasts. For the scope of this demo, we are only fitting and forecasting national data. Before forecasting, you must specify how many periods ahead you would like to forecast. This is defined by the steps parameter. Then, you forecast with the sarimaTDmodel$forecast() method. This model will forecast one year into the future (26 biweeks). Then, use the built-in $forecast() function to create your forecasts. This creates a new R6 object with your forecasts and many other useful built-in functions. Be sure to check out the Evaluation section for usage of the Forecasting function. To include the date_sick in the forecast_X$data$mat output, map the forecast to its predicted dates is to create a new data frame with the data from the missing year. Then, we will combine the output in forecast_X$data with the correct biweek dates. Now, we can add the forecast to the preds_df. Notice the $median() and $quantile() functions accompanied with $mat will produce matricies with the prediction medians and quantiles, respectively. Finally, you are able to plot your sarimaTD Forecast! Lets use ggplot2 to create a cool plot. This tutorial will demonstrate how to easily compare multiple models on ForecastFramework. One of the best advantages of ForecastFramework is the ability to evaluate many models at once with the same functions. Upload data from cdcfluview as dataframes. In this demo, we are only concerned with years between 2010 and 2017. We split training, testing, and truth data by excluding the 2016-17 Flu season in the truth set. A sample of the data we are forecasting. Then, preprocess the training, testing, and truth dataframes to become new incidence matrices. This script uses the ObservationList$new() ForecastFramework function to easily convert the dataframe to an IncidenceMatrix. The $formArray() is the second step to complete the IncidenceMatrix. Note: The time step in this example is 52 weeks; however, there are datasets with other timesteps (e.g. 26 biweeks) that would impact the calculations of t.step, dat$t, and max.year.time values. This demo will be evaluating the Generalized Additive Model (GAM), SARIMA, and sarimaTD models given different evaluation metrics. The GAM model is based on the model used in published real-time infectious disease forecasting research. Each model is fit with the training data. We are forecasting from the beginning of flu season 2016-17, 52 weeks into the future. Now for the fun part! How did the models perform? This question is easy to answer with ForecastFramework Models. Important Note: This is not a formal model evaluation or comparison. The goal of this exercise is to demonstrate different ForecastFramework techniques. Although the sarimaTD model appears to perform better than the other models in this example, a more in-depth analysis must be made before any conclusions can be made about model performance. Side-by-Side Forecasting Timeseries This function creates a time series visualization with the predicted median and quantiles displayed by a specific color. Notice forecast$quantile(0.025)$mat gives a matrix with a 2.5% quantile. Additionally, forecast$mean()$mat gives the mean forecast for that specific time period. Additionally, na.rm=TRUE, removes any NA values in the simulation to calculate the mean. Note the sparsity in the SARIMA forecast, due to some forecasted trajectories yielding undefined forecasted means (e.g. if one of the trajectories contains a non-numeric or NA value). This is one benefit of sarimaTD - the ability to provide stable long-term forecasts with the aid of transformations and seasonal differencing. It avoids some of the “brittlenes” that we have observed when just using SARIMA fitting out of the box. Common Evaluation Metrics Calculating evaluation metrics is easy with ForecastFramework objects. This Tutorial will demonstrate how to create a basic model with ForecastFramework. Models are created with R Object-Oriented programming, or the R6 package. It is essential to have a basic understanding of the structure of R6 Objects, before creating a ForecastFramework package. In this tutorial, the SARIMATD model will be created step-by-step. SARIMATD is a model created by Evan Ray. SARIMATD uses set of wrapper functions around the forecast package to simplify estimation of and prediction from SARIMA models. #' @param data The data to fit the model to. #' @method forecast Predict some number of time steps into the future. #' @method initialize Create a new instance of this class. The easiest way to incorporate a model into ForecastFramework is to pre-define your fit and forecast functions in a separate package, or use a separate package like the forecast package. The SARMATD package is hosted on GitHub and available for download with CRAN. #' @param y a univariate time series or numeric vector. #'   of class "ts". See the help for stats::ts for more. #'   "box-cox", "log", "forecast-box-cox", or "none". See details for more. #' @param auto.arima_d order of first differencing argument to auto.arima. #' @param auto.arima_D order of seasonal differencing argument to auto.arima. This section is comprised of inputs in your model that are not able to be accessed by the user directly, but will be updatable in the later initialize section. The arguments in the fit() and forecast() functions are fixed without incorporating private fields. For example, the nsim (number of simulations) may change, which makes it necessary to add these updatable variables in the private section. However, notice that all private variables include a . in the private section. This is the common way of distinguising a private variable in R6. Cycle though each province and use the fit_sarima() function. Using the pre-defined equation simulate.sarimaTD() for the forecast method. nmodels, sim_forecasts and dimnames(simforecasts) are all variables needed to define a simulated forecast in ForecastFramework. Now, the Provinces are iterated through and simulated with the simulate.sarimaTD()function (called as just simulate()). Then, there are a couple of matrix transformations to input the simulated matrix into the SimulatedIncidenceMatrix() Object. The initialize method is to initialize inputs. In this case, one input that needs initialization is the period (number of biweeks). We will ignore this section for now. It is a more advanced level and stay tuned for another vignette that expains active binding. Lets now test the model on the same biweek counts as the SARIMA demo. The output is a forecasted case count for 26 biweeks.